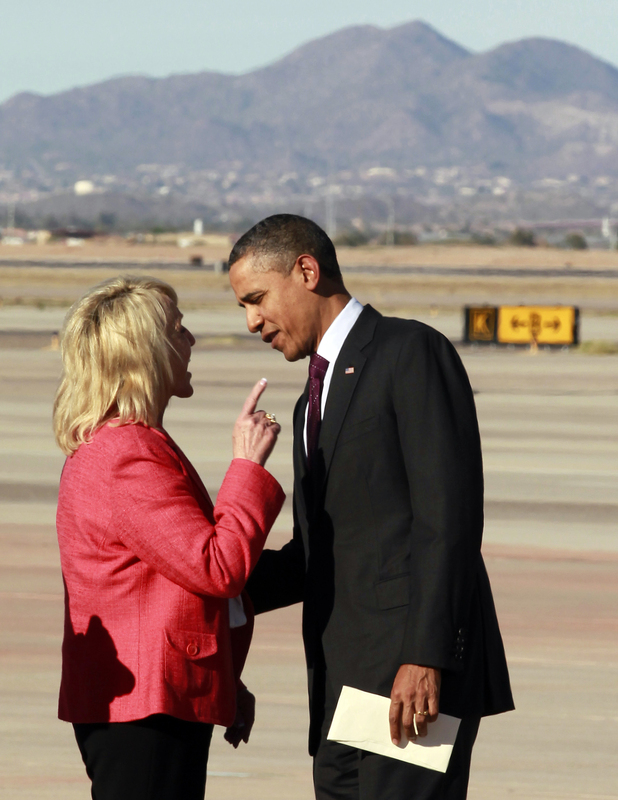 Jan Brewer gives President Obama the Finger… Sort of. Jan Brewer, the Governor of Arizona, met President Obama at the airport as he landed in her state for a visit on January 25th. Governor Brewer describes a meeting with the President in her book, Scorpions for Breakfast, in a way that the President disputes. She described him as condescending and he claims that the meeting was cordial. This was apparently brought up on the tarmac and the photo above was snapped by reporters watching the exchange. “The governor handed the president a letter and said she was inviting him to meet with her. The president said he’d be glad to meet with her again, but did note that after their last meeting, a cordial discussion in the Oval Office, the governor inaccurately described the meeting in her book,” a White House official reportedly said. “I felt a little bit like i was being lectured to, and I was a little kid in a classroom, if you will, and he was this wise professor and I was this little kid, and this little kid knows what the problem is and I felt minimized to say the least,” she said, according to CBS. The right-wing blogoshphere has erupted in her defense but what if the photo was reversed? If the President had his finger in her face? How do you think that would go over? Exactly. Republicans are Racists… Or, at the least, they’re rude.